Unflinching slavery drama “12 Years a Slave” took home the Oscar for best picture at Sunday’s Academy Awards, and its star Lupita Nyong’o added to the film’s trophy case by claiming the best supporting actress award. 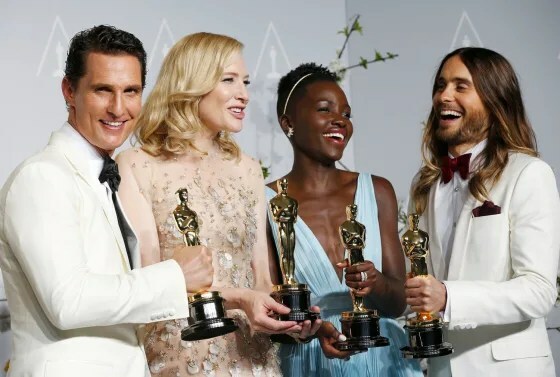 Best actor winner Matthew McConaughey, best actress winner Cate Blanchett, best supporting actress winner Lupita Nyong’o and best supporting actor winner Jared Leto pose with their Oscars. London-born McQueen is the first black director to take home a best-picture award. In a teary, heartfelt speech, Nyong’o saluted her enslaved character, Patsey, and Solomon Northup, the free black man who was kidnapped and sold into slavery in 1841, and wrote the memoir upon which the film is based. The film also won the best adapted screenplay award. 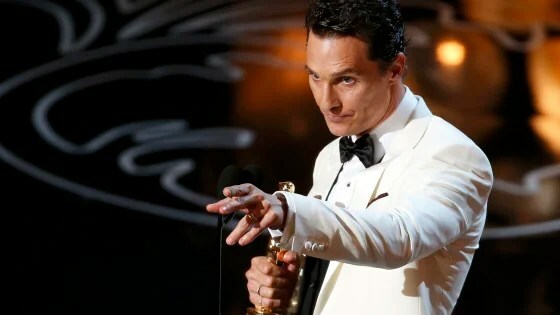 Fans of Matthew McConaughey are feeling “alright, alright” after the actor proved the road to “McConaissance” is indeed paved in Oscar gold when he won the best lead actor award for “Dallas Buyers Club,” in which he plays Texan Ron Woodroof, who smuggled unapproved drugs into the United States to fight AIDS. 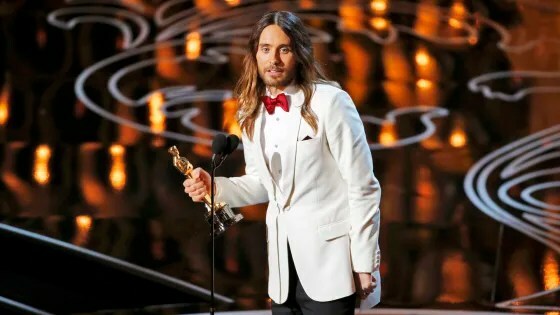 McConaughey’s “Dallas Buyers Club” co-star Jared Leto won the best supporting actor award for playing transgender Texan Rayon. 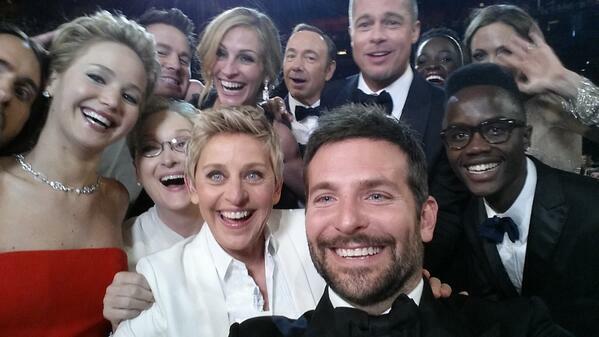 Hollywood’s brightest stars gather to celebrate the biggest achievements in film. But it wasn’t all serious talk for Leto, who also mentioned the conflict in Ukraine during his speech. Before even winning his award, host Ellen DeGeneres joked that he was the “most beautiful” person at the ceremony (with his enviable ombre highlights and crisp tux, can you deny it?). And after he won, backstage observers reported that he was passing his Oscar around and allowing others to be photographed with it — until Academy officials requested he stop. On a fairly predictable night, DeGeneres lightened things up with some surprises — taking a celebrity-studded selfie, having pizza delivered to the audience, and suddenly appearing in full pink pouf as “Oz’s” Glinda the Good Witch. That’s not to say the broadcast was completely safe. Degeneres did get some jabs in: She praised 84-year-old nominee June Squibb, and then raised her voice and spoke slowly and loudly to the actress as if speaking to a hard-of-hearing elderly person, saying, “I’m telling everyone that you were wonderful in ‘Nebraska. 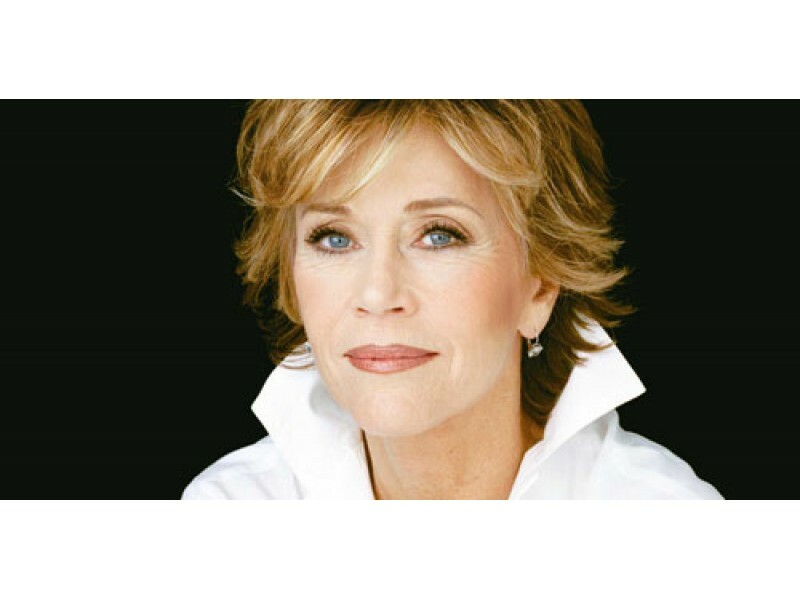 '” The audience, and more importantly Squibb, all got a good laugh. The night was exceptionally starry for space drama “Gravity,” which claimed numerous technical awards and the best director statuette for Alfonso Cuaron, the first Latino to win in that category. From dazzling gowns to sophisticated tuxedos, see which styles dominated the red carpet at the 86th annual Academy Awards. “Gravity’s” awards included best film editing, cinematography, sound editing, best score, sound mixing and visual effects. Disney blockbuster “Frozen” claimed the best animated feature film Oscar, and its hit song, “Let It Go,” won for best original song. “Happy Oscars to you, let’s do ‘Frozen 2,’ sang husband-and-wife winners Kristen Anderson-Lopez and Robert Lopez. The song was performed live, in a much-awaited performance, by Broadway star Idina Menzel, who voices and sings the role of Queen Elsa in the movie. Menzel took the stage after actor John Travolta mangled her name, sparking plenty of jokes on social media. “Mr. Hublot” won for best animated short. “Helium” for best live-action short film. “The Lady in Number 6,” about Alice Herz Sommer, a Holocaust survivor and concert pianist who died Feb. 23 aged 110, won for best documentary short subject. “20 Feet from Stardom,” which focuses on the backup singers behind musical legends, won for best documentary feature. Italy’s “The Great Beauty” won for best foreign-language film. Adruitha Lee and Robin Mathews of “Dallas Buyers Club” won the award for makeup and hairstyling.